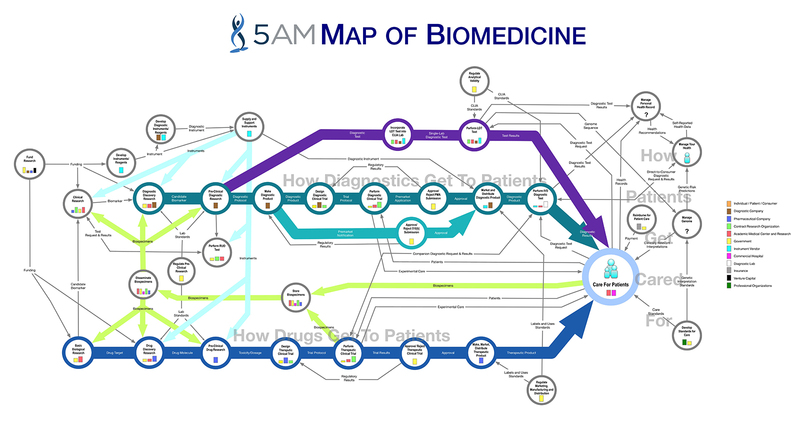 In my Map of Biomedicine blog posts, so far, I’ve focused on how diagnostics get to market. But you may recall that way back in my first post I discussed the major themes of the map - what I called ‘vignettes’. The first vignette was the development of diagnostic tests, which is what I’ve focused on so far. Those blog posts are being collected and expanded in an e-book which will be released soon, so keep an eye out for that. In my last post, I concluded that vignette, so now I’m ready to start the next one. But before I do that, I wanted to show a new version of the map. I engaged with Doug League, one of the talented designers at 5AM, to improve how the map looks. The new version, shown below, is like a public transportation map of healthcare and lifesciences. The thicker arrows highlight the processes with the greatest capacity (like trains), followed by narrower arrows (like streetcars) and lastly the narrowest lines (like buses or taxis). You can see I’ve highlighted the three Vignettes - ‘How Diagnostics Get To Patients’, ‘How Drugs Get To Patients’ and ‘How Patients Get Cared For’. In this series of posts we’re going to talk about how drugs get to patients. There are some similarities to how diagnostics get to market, of course. Discoveries are made in research settings, and are then commercialized by companies that navigate regulatory approval processes, which include clinical trials. A drug’s success is judged by many different groups, including physicians, patients, insurance companies and the drug companies themselves. If you take a look at the Map, you’ll see the line labeled ‘How Drugs Get To Patients’ has multiple steps in it that are related to clinical trials. Clinical trials are the key to determining whether a drug works or not, so are naturally a major part of this process. They are also incredibly complex and one of the major costs of developing drugs. A big part of this series of blog posts will be a discussion of how clinical trials work. Trials are divided into phases, I, II, III and IV (clinical trials and the Super Bowl are apparently the only places that roman numerals are still used), each one with a specific goal. Of course, the primary goal of a clinical trial is to show that a drug works better than the alternative, which can be either another drug or no treatment at all. Even when comparing a drug to no treatment, the patient’s perception can complicate things. The placebo effect is the situation where patients can respond to the idea of getting a drug, even when they don’t get any real drug. This is an incredibly interesting concept and it informs how trials are designed, so I’ll devote a post to the topic. Clinical trial design is a field all by itself, but I will discuss several new ways of structuring trials that are more suitable for the world of personalized medicine, including basket trials and multi-arm trials. There are also patients who, understandably, don’t want to -- or can’t -- wait for clinical trials to finish. I’ll talk about how patients sometimes get drugs before they’re approved through a program called compassionate use. There’s an incredible amount of information captured during clinical trials, so I’ll talk about how that information is captured, analyzed and shared. There are several ongoing efforts to more freely share clinical trial data with researchers and patients, so I’ll describe those. And lastly, drug pricing is a major issue in these days of healthcare reform, so I’ll talk about how the prices for drugs get set. I’m really looking forward to getting back to blogging and talking about how drugs get to patients. Thanks for reading!